﻿ Growing orchids in Winter. How to winterize your orchid culture. Fall is a time when some kinds of orchids need very different care from what they required in the summer. In some cases, these differences are very great, while in others, the cultural changes required are more subtle. Standard Phalaenopsis, those with large flowers and no fragrance, require a cool down period of 7-10 days to initiate flowering. How cold should they get? Most experienced hobbyists let temperatures get into the low 60s or even upper 50s, which generally works well. This process is even more effective if day length is getting shorter and plants are allowed to get a little drier than usual. It is also a good idea to only let phals get cooler when there is some assurance that day temperatures will warm up at least 10-15 deg F. Many commercial growers accomplish spike initiation simply by providing this day to night temperature differential and do not worry about how cool the night temperature. Many indoor growers of phals find that their plants do not initiate spikes until much later in the year because they do not let their home get as cool or experience this temperature range. Putting phals in an unheated porch can get them to spike. Once the first spikes appear, it is important to maintain a night temperature of at least 65 deg F to limit disease. This becomes more critical when those gloomy days appear in winter. It is also important to increase fertilizer, especially nitrogen to growing spikes and buds. Conventional wisdom used to dictate a fertilizer low in nitrogen and high in phosphorus until buds began to form and then switch to high nitrogen fertilizer to get the most and largest blooms. Recent studies point to just using nitrogen-rich fertilizers throughout the process. While commercial or exhibition growers practice this, the hobbyist is better advised to use their normal fertilizer regimen if their phals are growing well. Catasetums and related genera are in the process of becoming dormant. Withhold water and fertilizer as their leaves begin to yellow. A light misting is OK, but let the plant and medium become much drier than when the plant is actively growing. Any orchid that loses its leaves needs to be treated similarly. Many semi-terrestrial orchids, e.g. Eulophia species, need similar treatment. Too much water at this time of year will cause the plant to lose its roots to rot and the entire plant could follow. The ideal situation is to set orchids with this requirement in a different growing area where water can be carefully controlled until growth begins in late winter or early spring. Many members of the Cattleya Alliance will also benefit from drying more thoroughly. 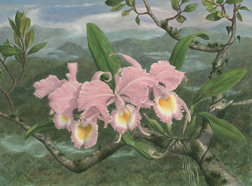 Bifoliate cattleyas and cattleya species are generally grown drier in winter, although there is much variation among them. Some species reputed to be hard to grow, e.g. C warscewiczii and C dowiana, need to be kept very dry from about October through February or they will not produce good flowers and might even die. Modern hybrids have had the tendency to “die if they do not dry” “bred out”, but they still grow better if they are kept drier in winter. The exceptions to the rule are those small stature mini-catts that have a good dose of Sophronitis coccinea. They usually are generally identified by their bright red, yellow or orange flowers. These need a constant temperature, above 60 F, regular water supply, and may not experience any dormancy. Cymbidiums require cool weather to initiate flower spikes too, but they require far cooler temperatures and lots of light. Place them outside as temperature drop and keep them there until there is the forecast for a hard freeze or hard frost. They will tolerate light frosts. Vandas are the last group that needs to be singled out. They like it hot and bright all year long, although they are perfectly capable of surviving nights in the mid 50s on occasion. They may, however, drop flowers or buds if the cold is prolonged. The exceptions are those members that have blue flowers. The parent contributing blue color to flowers comes from higher elevations and so, tolerates or even prefers cool nights.